Nassau, Bahamas - Enjoy a night of art, celebrating the Heritage and stories of the Bahamian and Haitian cultures on May 20th at Jacaranda House. 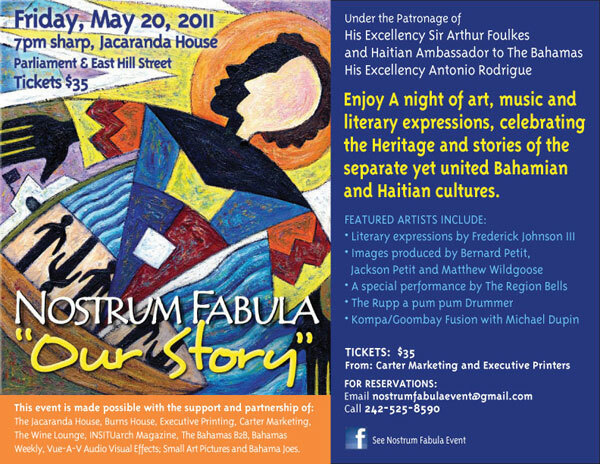 Under the Patronage of His Excellency Sir Arthur Foulkes, and Haitian Ambassador to The Bahamas His Excellency Antonio Rodrigue, Nostrum Fabula - "Our Story", will share through art and imagination the separate and united stories of both cultures. The Jacaranda House; Burns House; Executive Printers; Carter Marketing; The Wine Lounge; The Bahamas B2B; INSITUarch Magazine; The Bahamas Weekly; Vue-A-V Audio Visual Effects; Small Art Pictures and Bahama Joes.